BY MADELEINE NEIMAN, 2014–2015 Samuel H. Kress Conservation Fellow at the Kelsey Museum. During her time here, Madeleine’s work will focus on the technical analysis and treatment of objects from Seleucia on the Tigris, a site approximately 18 miles south of modern-day Baghdad, Iraq. What are the artifacts made of and how are they made? What is the condition of the object? More simply, is there any evidence of damage or deterioration (e.g., breaks, cracks, discoloration) present? Have the objects been modified (e.g., repaired or reused) in any way by modern or ancient people? Conservators utilize a number of tools to help us answer these questions. Today I thought I would share with you a bit about one of our most commonly employed techniques — examination under ultraviolet light. Light is a form of electromagnetic radiation and exits as part of a large electromagnetic spectrum. Ultraviolet radiation, often called UV light, refers to that area just below what is visible to the human eye. While we can’t see UV light, when it illuminates the surface of an artifact, certain types of materials, including some dyes, minerals, and resins commonly found on archaeological objects, fluoresce. These materials glow different colors! Among the over 13,000 objects in the Seleucia collection are a group of bone figurines. Several of these are decorated with a reddish-pink paint that displays a unique orangey-pink fluorescence. 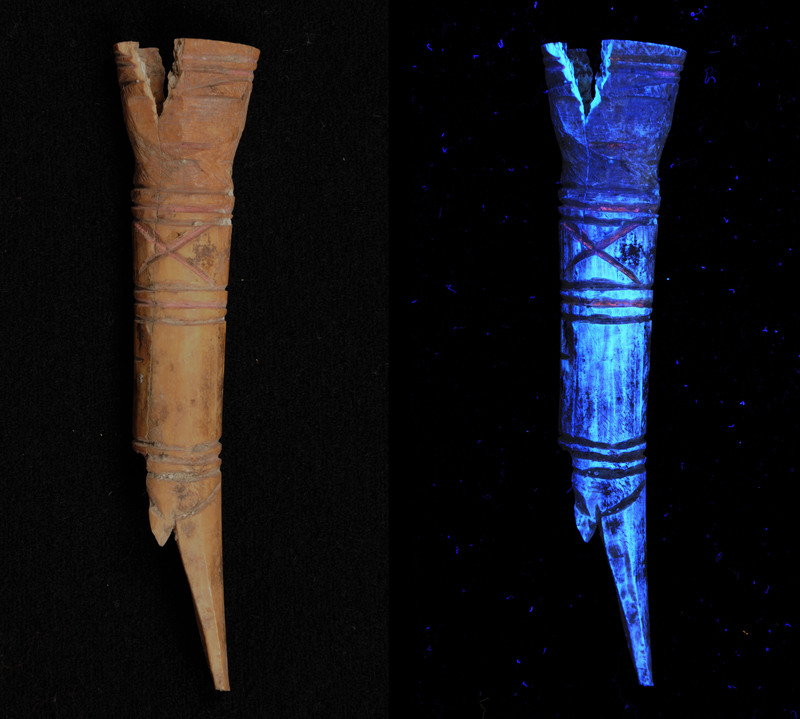 Images of bone figurine (KM 16187) with pink paint captured under visible (left) and UV (right) illumination. In antiquity, people created paints using mineral pigments as well as organic colorants found in plants and animals. Among the most common sources of red were the pigments hematite (iron oxide), cinnabar (mercury sulfide), and red lead as well as the dyes kermes (from the Kermes vermilio insect) and madder (from the plant Rubia tinctorium). When viewed in visible light all five appear red. However, when examined under UV light, one stands out: madder. Madder contains four principal colorants: alizarin (red), purpurin (red), pseudopurprin (red) and xanthine (yellow). The purpurin and pseudopurpurin glow a bright orangey-pink when exposed to UV light, making it easy to distinguish. By examining the figurines under UV light we can tell that an ancient artist used madder to decorate these figurines!